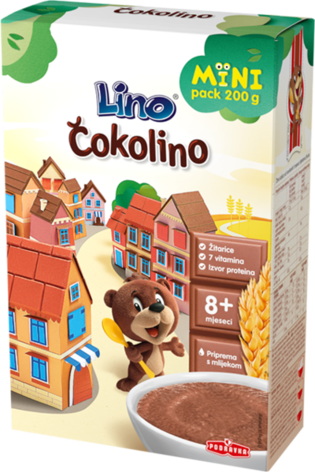 Čokolino has been favourite family meal over years due to its soft flakes with chocolate which when mixed with 2 dl of milk turn into a very nutritive meal. add 5 heaping tablespoons (30 g) of flakes into 200 ml of cooked milk (cooled to 50°C). 55% cereals (wheat semolina, wheat flour), sugar, powdered chocolate 18% (sugar, cocoa powder, cocoa butter, emulsifier soya lecithin), starch and vitamins (thiamine mononitrate, riboflavin, pyridoxine hydrochloride, L-ascorbic acid DL-alpha-tocopherol acetate, folic acid, nicotinamide). May contain hazelnuts and milk. Storage: keep in a dry place at room temperature. Keep the bag and box well closed after opening. Once opened, use within three weeks.